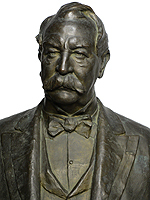 A Very Fine and Larger-Than-Life and Very Realistic Museum Quality Patinated Bronze Bust of President William H. Taft (1857–1930) by Frederick Ernst Triebel (American, 1865-1944) - Cast by Nelli Foundry, Rome. William H. Taft, the 27th President of the United States and Jurist, is depicted with his renown thick mustache and wearing a bow tie, vest and coat. Inscribed on the back: F.E. Triebel. Sculp., and Fond. Nelli, Roma. Circa: First Quarter 20th Century. Note: Due to its size, subject and high quality, this bust was probably commissioned for a Museum or public exhibition, such as an embassy or government building, the same way as other similar works by the sculptor. The Roman foundry operated by the Nelli family during the last quarter of the 19th century cast works for many leading sculptors of the day, including Alfred Gilbert and Anton Van Wouw. 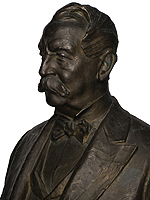 A life-size Marble Sculpture of Henry Mower Rice, also by Frederick E. Triebel, is part of the collection at The National Statuary Hall at The Capitol in Washington D.C.
A Very Fine and Larger-Than-Life and Very Realistic Museum Quality Patinated Bronze Bust of President William H. Taft (1857–1930) by Frederick Ernst Triebel (American, 1865-1944) - Cast by Nelli Foundry, Rome. William H. Taft, the 27th President of the United States and Jurist, is depicted with his renown thick mustache and wearing a bow tie, vest and coat. Inscribed on the back: F.E. Triebel. Sculp., and Fond. Nelli, Roma. Circa: First Quarter 20th Century. 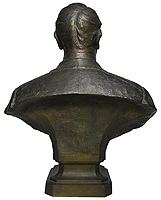 Note: Due to its size, subject and high quality, this bust was probably commissioned for a Museum or public exhibition, such as an embassy or government building, the same way as other similar works by the sculptor. 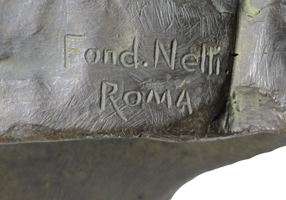 The Roman foundry operated by the Nelli family during the last quarter of the 19th century cast works for many leading sculptors of the day, including Alfred Gilbert and Anton Van Wouw. 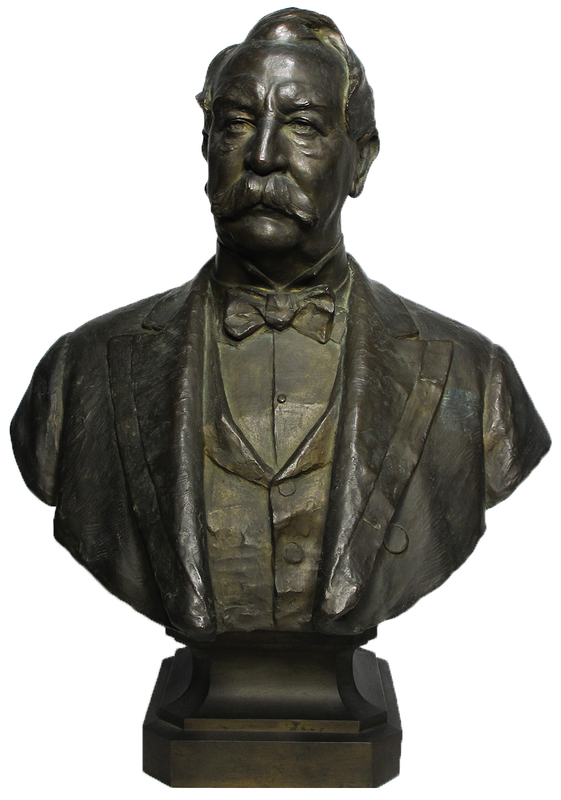 A Life size Marble Sculpture of Henry Mower Rice by Frederick E. Triebel is part of the collection at The National Statuary Hall at The Capitol in Washington D.C.